Nearly 250 km long, the Saar River meanders through the breathtaking countryside of France and Germany. Travelling along this river one would expect to see stunning forest landscapes, canals, old bridges, and the occasional village. 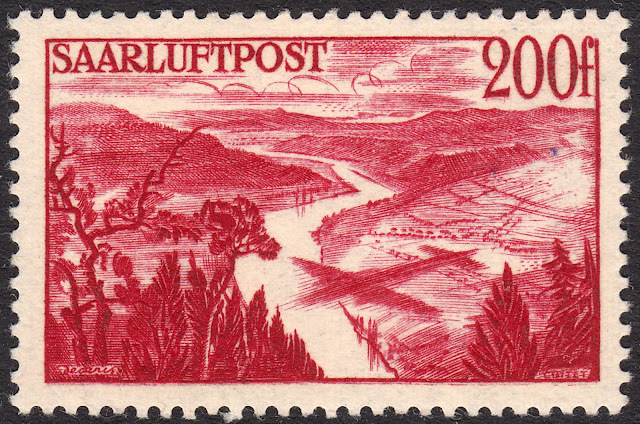 The Saar River also boasts.the UNESCO World Heritage Site Völklinger Hütte, and the famous Saar Loop at Mettlach. Over time the river has played a vital role for industry in Saarland, being used to ship raw materials for the coal, iron and steel industries. 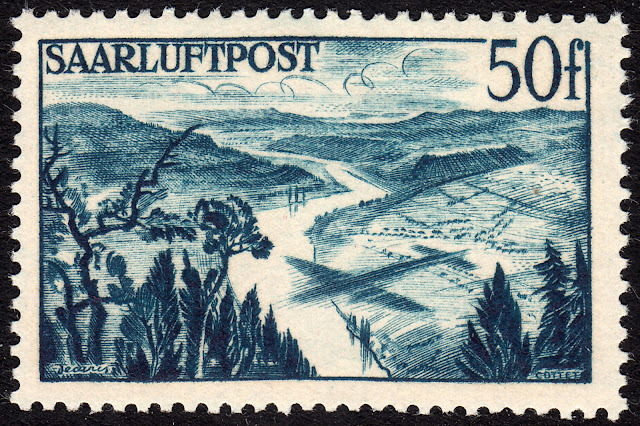 And the fertile banks of the Saar were perfect for wine growing, which continued up till the early 20th Century. For more on Saarland check out THIS blog post. 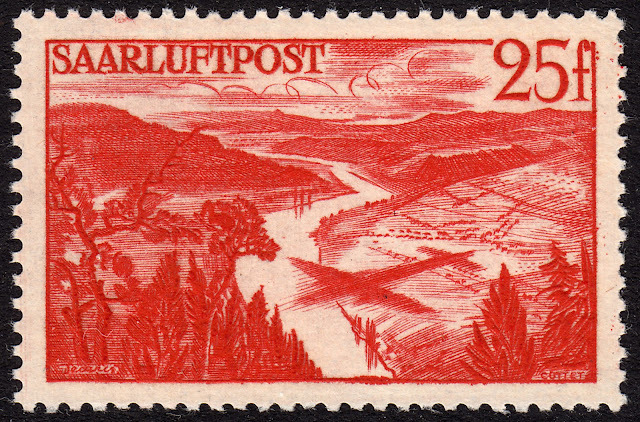 On 1 April 1948 a set of three airmail stamps were issued for Saarland (Saar Protectorate). One design was used for all three values. The designer was Albert Decaris. René Cottet engraved the design. It is a stunning design, featuring the silhouette of a plane flying over the Saar River. I love this design, and while studying it I grew curious as to what type of plane the silhouette might be representing. The main problem I faced was, does the silhouette accurately represent the plane it is supposed to be depicting? And for that matter is it an actual plane being represented? Assuming the silhouette is accurate, and that the plane has two engines, one on each wing, I didn't have much luck finding a match. But if we perhaps extend artistic license a bit and go with the possibility of the plane having two engines per wing, then I may have found a possible match. 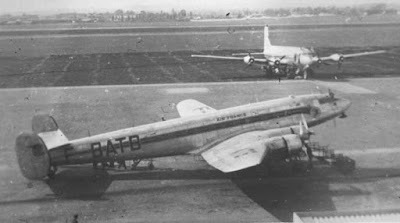 The plane could possibly be a SNCASE SE.161 Languedoc. As I say, this is merely a possibility. I have found no definitive evidence either way. If anyone out there can shed any light on what type of plane the silhouette might represent, I'd love to hear from you.